*Also worth noting, the studies that produced these deleterious effects from a lack of sleep were performed on male college athletes who had 3+ years of experience with lifting weights. It’s safe to say nearly all aspects of our physiology and biology are impacted in a severe way if sleep is impaired or limited especially if we are training. As you well know, the toll on our bodies from training takes quite a beating. One of the key pieces people are unaware of with regards to sleep is our release of growth hormone during rest allowing us to regenerate and grow accordingly. If that vital time is limited, our ability to grow and adapt to training will also be limited. It’s not hard to dig a deep hole, it's far more difficult to fill it back up. Now that we know the importance of sleep, let’s get into some specifics around prescription relative to goals. Based upon Walker’s research, we want to be allocating 7:30-8:30 hours of sleep per night for the average human. Now 7:30-8:30 hours is the recommended amount of time for the average person. Once we introduce the element of training this shifts the quantity of sleep quite a bit. *As a side note, requirements of sleep decrease over a lifespan. For example, look at how much sleep a baby needs relative to your grandparents. An in depth look at that continuum is outside the scope of this post but plenty of fascinating research is out there to investigate. One of my general rules of thumb for athletes I work with, if they train 3-7 times per week, 8-8:30 hours per night is a nice range of rest for recovery. If they are under the age of 21, they will need more sleep approaching 9-9:30 hours per night as the body is still developing and growing. Athletes of mine who train 8-12+ times per week need to be closer to 9-9:30 hours per night to optimally recover from the training. As we train more, the body is going to need more sleep. One’s ability to train more will be predicated on their ability to recover and this will be based on their sleep duration and quality. Now, most of you might think, how can I even sleep that long? First, your body has to be set up to want to sleep that long. 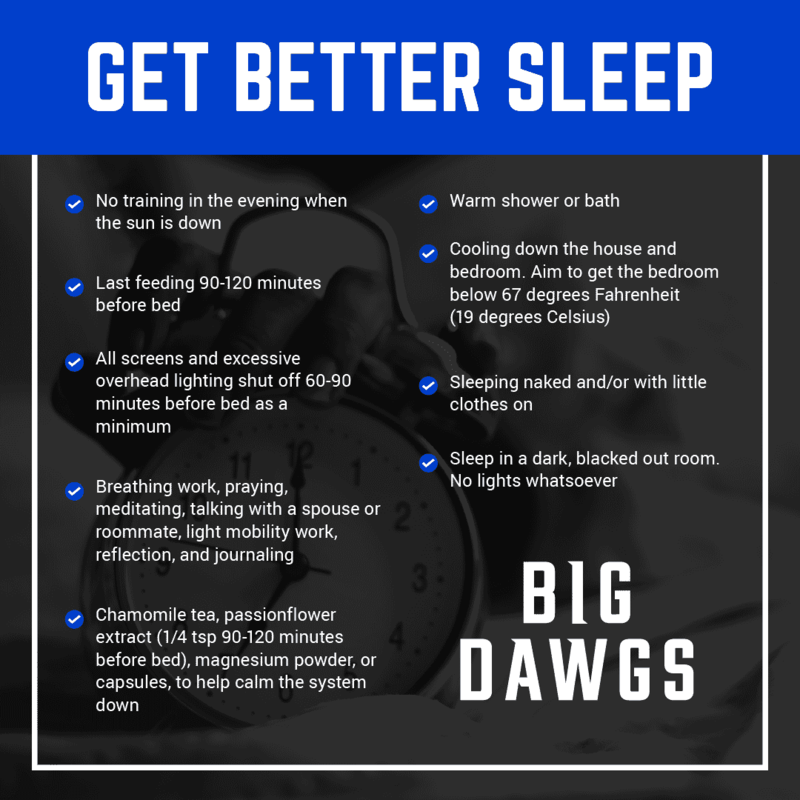 For a more detailed explanation, I suggest you read my blog post on the “Wind Down.” That will help give a bit more insight on what I mean by “set up” to want to sleep that long. The condensed reasoning, our bodies (mentally, physically, emotionally) are overstimulated majority of the day. As a result, it becomes increasingly difficult for our systems to wind down and transition into a parasympathetic state to rest effectively. As a result, we have to cultivate an environment where our system can rest and recover. No training in the late evening when the sun is down. This can cause an unnecessary spike in cortisol prolonging our onset to sleep. Last meal 90-120 minutes before bed. Ensure you are chewing it well, sitting down, and enjoying it. All screens and excessive overhead lighting shut off 60-90 minutes before bed as a minimum. The earlier the better; excessive blue light can signal the pineal gland that there is daylight delaying our onset to sleep. Breathing work, praying, meditating, talking with a spouse or roommate, light mobility work, reflection, and journaling. All helpful tools you can use to help calm the nervous system down and transition into a more parasympathetic state slowing the mind and body down. Chamomile tea, passionflower extract (1/4 tsp 90-120 minutes before bed), magnesium powder or capsules to help calm the system down. Chelates over salts when choosing magnesium supplements; Magnesium glycinate over Magnesium oxide. Warm shower or bath. These will help dilate blood vessels on the surface of the skin causing the body to expel heat enabling the core temperature to drop, which is a vital piece for us to sleep. Sleeping naked and/or with little clothes on. This will further help our core temperatures drop. Sleep in a dark, blacked out room. No lights whatsoever. You shouldn’t be able to see your hand in front of your face once the lights are off; this will ensure no skin receptors or photoreceptors are activated that can signal the pineal gland potentiating a waking state. To close, every aspect of an athlete’s performance and physiology is negatively affected by a lack of sleep and lack of sleep quality. We need to ensure we are setting ourselves up to sleep, getting enough relative to our training volume, and allocating enough hours to sleep.